Online Private and Group Sessions are also available. When are your sessions runs? Semi Private and Group Classes range from $3 to $30 per class. Packages available. Please contact us for more information. How much does a private session cost? Can I join you, I have never exercised before? Absolutely! 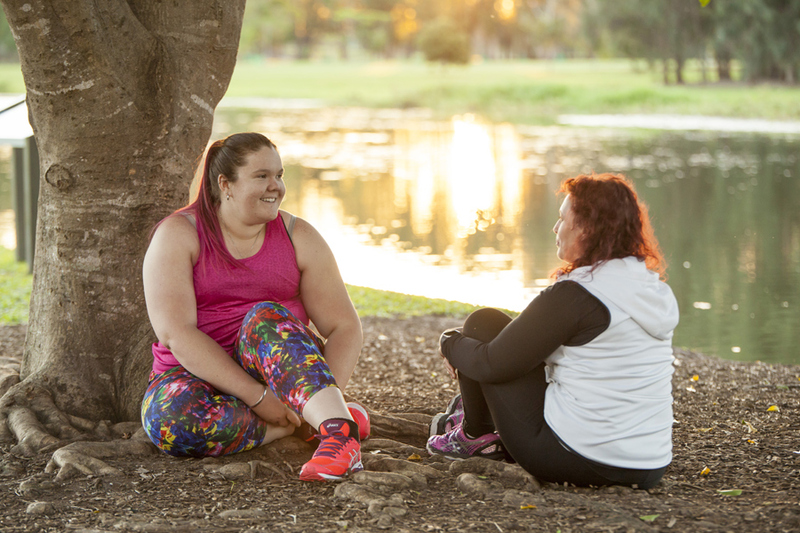 We are trained professions who hold Certificate 4 in Personal Training, Group Fitness, senior fitness and pre-post pregnancy as well as Continence Foundation Core and pelvic floor trained. We hold current insurance and are members of governing bodies within the fitness industry. I have a medical condition and have a medical certificate to clear me to exercise, can I train with you? We offer advice from the Australian Dietary Guidelines and work closely with Dieticians and nutritionists. We will never sell you shakes, potions, lotions or pills. We prefer to work with you on creating a healthier lifestyle incorporating fresh produce. You will be welcomed and asked to fill out some medical and other forms and we will go through any issues or concerns you have BEFORE we commence exercise. For group sessions you will be closely monitored throughout and gently encouraged with all the exercises demonstrated to you. You will be guided by your fitness professional as to when to stop and rest as well as when to change exercises up. You are never asked to keep up with anyone else in the class. You work at your own pace. For Private coaching we go more in-depth and you will be asked to complete a Body IQ lifestyle assessment as we look at all factors of your daily life. This is so we can start to create specific goals for you. What do I bring my first session? Wear comfortable clothes to move in, runners and bring a water bottle and towel with you. What things do you work on in each session? We work on movement patterns, lifestyle factors, mindset, agility, strength, balance, cardiovascular health, hormonal health and many other factors. Will you lias with my allied health professional? I am quite anxious to start anything new, will you be undertanding towards my needs? We know what it is like to start out as we have lived this also. You will be made to feel very comfortable and put at ease after your very first session. I have limiting physicality’s are you able to work around this? As a general rule yes, however we would love to discuss this with you further to see if we are a good fit for each other. Please contact us to arrange a phone call to discuss your needs. Do you offer mindset and life coaching? Absolutely we do. This is a very important part of our holistic view and we have a dedicated program for this type of coaching. Do you offer partnered sessions? I am a nervous newbie will you scale the exercise to meet my needs? We are considered the best in the business for modified exercises and thinking outside the box coaching, so you are in good hands and will never be asked to do anything you do not want to do. I haven't exercised in a very long time, will this be suitable for me? Yes definitely, you will be guided and educated and met at the ability you are at right now. I have never exercised before, is this a problem? No it is not a problem. You will be gently guided at a capacity that suits you as well as educated on your body and it’s needs. I am in a larger body will I be able to participate? I have a pelvic dysfunction (prolapse, incontinence, other) is this suitable for me? Yes with our dedicated Focus on Core program you will be able to start moving in a way that suits you and your needs. We are fully qualified in Core and Pelvic Floor for exercise health and our aim is to get you moving in a capacity that suits you! Am I able to rest if I need to during a session? Absolutely! You can take as many rest breaks as you need. Depending on the type of coaching you require we use things like treadmills, bikes, hand weights, barbells, balls and resistance bands. This is not an exhausted list as we use an array of different tools to help you achieve your goals. I cannot lift more than 5kg due to pelvic dysfunction, is what you do suitable? Yes! We have many women who we coach with restrictions on lifting and our job is to find you a balance making sure you are using your abdominal system correctly and safely. I have had a hysterectomy, is this suitable for me? Yes. We coach women after surgery and after they have been cleared by their specialist to gently get back into movement. I have had back surgery, can I join you? Yes. We will work with you after your surgery and you have been cleared by your doctor to gently get you moving in a capacity that suits you. We do offer a free 15min private consult to all enquiring clients who wish to meet with us and discuss their requirements first. If there are further questions you need answered please feel free to contact us.